If you find yourself in the city of Porto, and if you have taken your fill of the gorgeous waterfront, the amazing tours of the Port Wine Lodges, and the walking back-and-forth across the bridges, you should get yourself a train ticket. Arrange to leave early in the morning, when the São Bento Railway Station is a world unto itself, and be sure and get some snack bar café com leite for the road. Pick up a few custard tarts – Pasteis de Nata – as well, just because one should never pass up the opportunity for Pasteis de Nata, and you can only get the real deal in Portugal. Make sure your ticket is for Pinhão, and grab yourself a window seat. Prepare yourself for a short journey, only about two hours, and don’t be concerned that there might be some error in the schedule. This is not the high-speed train that whisked you 200 miles from Lisbon to Porto in 140 minutes, but one that will wind you along the banks of the Douro River, pull you through dark tunnels, and rattle you along cliff-hanging tracks. It will indeed take two full hours to cover 70 miles. Your train journey will land you at the Pinhão train station. You’ll be smack in the middle of the Cima Corgo, the geographic center of the Douro River Valley D.O.C., and the core of the Port Wine production region. You’ll be able to check into a rustic little hotel or take a suite at The Vintage House, a somewhat incongruous yet delightfully glistening resort. You’ll be able to wander the steep riverside streets in search of lunch or take a death-defying taxi ride straight up the side of the mountain to Fonseca’s Quinta do Panascal Vineyards. 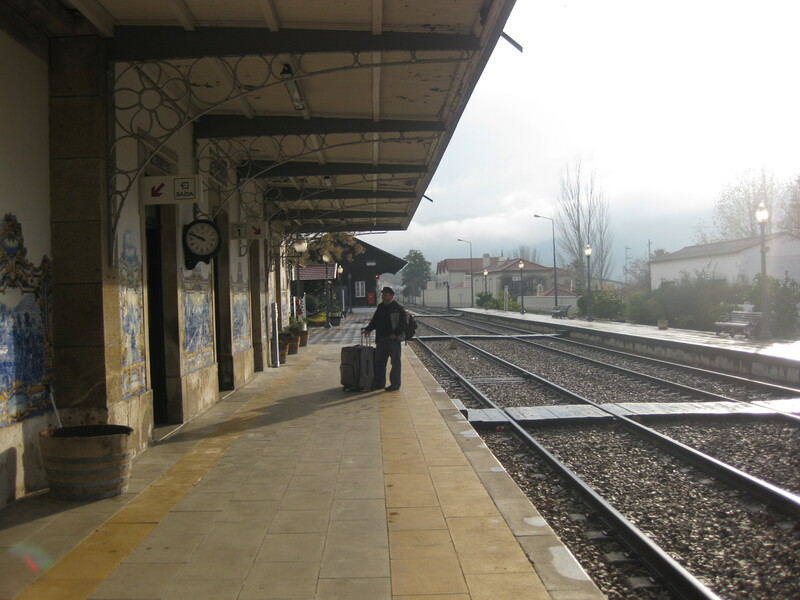 But before you can check into the hotel, wander the streets or tour the vineyard, you will have to tear yourself away from the train station itself. It’s just a tiny station and only one room. It is so unsophisticated that you have to hustle down and across the train tracks themselves (no fancy pedestrian overpass or glass elevator here) once you figure out which way – and on which side – your train will be heading. But you’ll find it hard to tear yourself away once you notice the blue tile mosaics, a local specialty known as azulejo – that line the walls of the station. 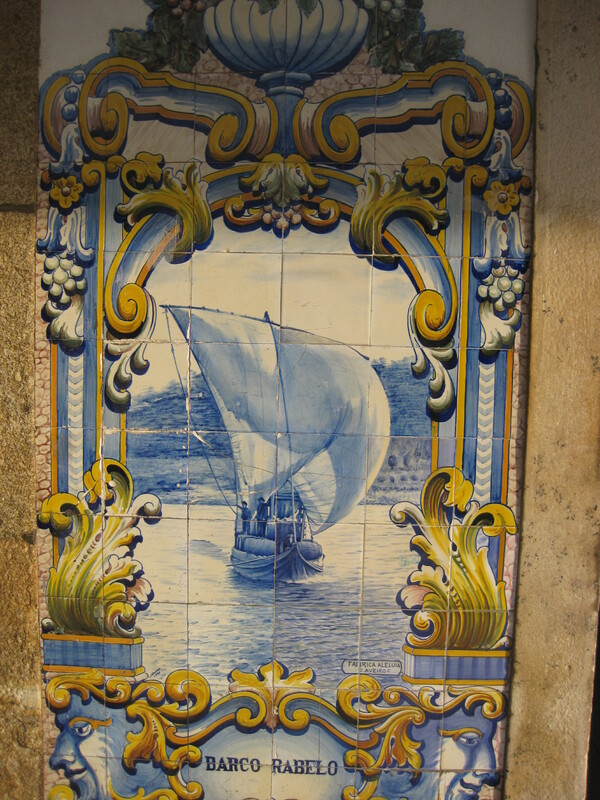 Azulejo is a form of Portuguese painted, tin-glazed, ceramic tile work. 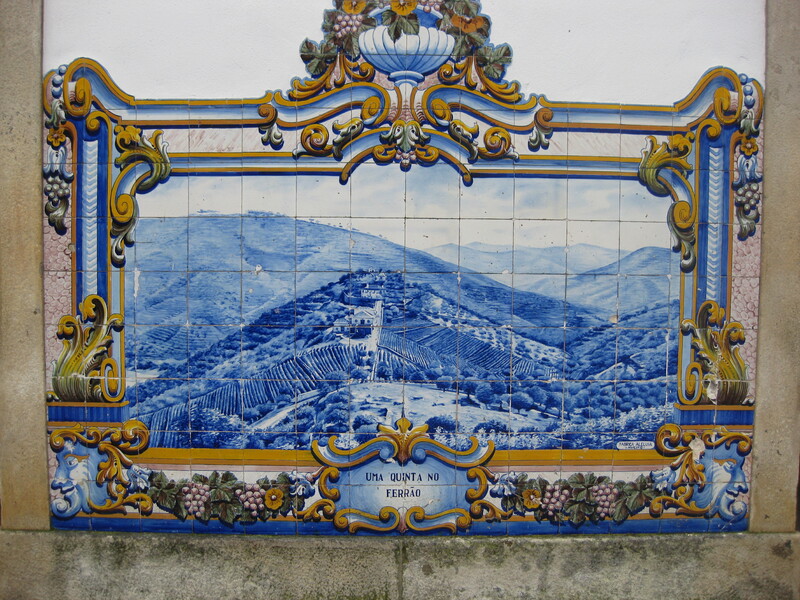 A central aspect of Portuguese culture, Azulejo has been produced without interruption for five centuries. 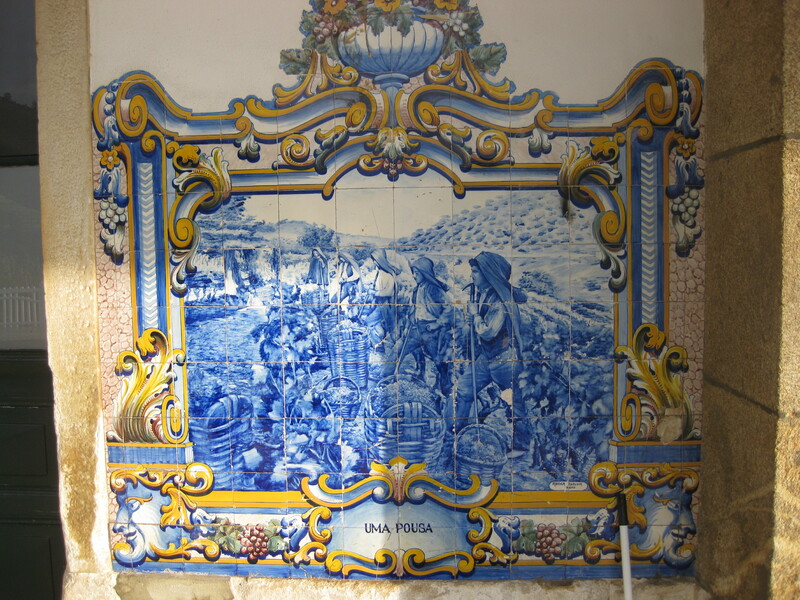 There is even a national Azulejo gallery in Lisbon – although you can see Azulejos everywhere in Portugal. Azulejos are found on the interior and exterior of churches, palaces, ordinary homes, department stores, and, as you can tell from my story, railway stations. 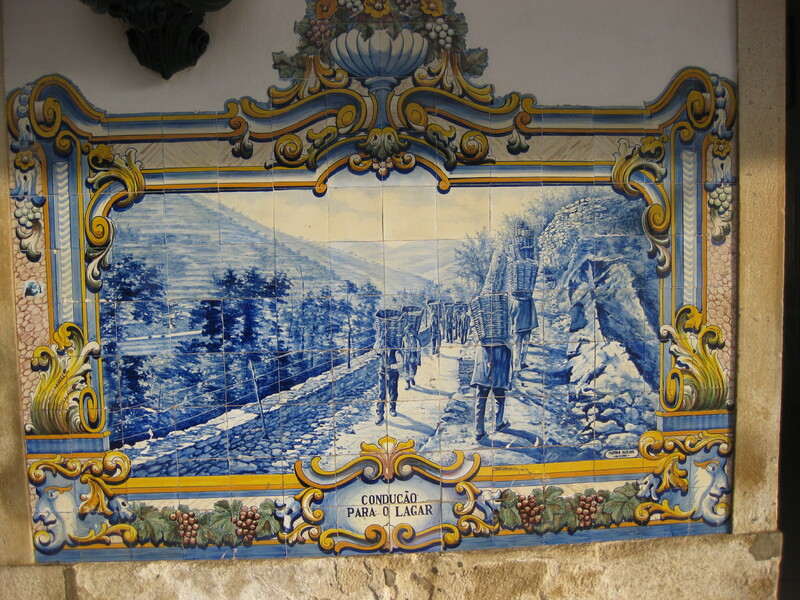 These beautiful Azulejos have been a part of the Pinhão train station since 1937. They chronicle the history of the town and the vineyards, the wineries, and life along the Douro River. Pictures of Pinhão from the Portugal leg of our Iberian Penninsula honeymoon, 2010. That’s Shields T. up there, guarding the luggage while his wife takes pictures of the walls. Reading this brings back memories of the Blogger-Media Fam Trip associated with the International Wine Tourism Conference and Workshop held in Porto in 2011. We were based in nearby Quinta do Pégo. It is quite unforgetable, isn’t it! !